poorer sections of the society. and development of this sector. NATHEALTH announced its new Leadership Team for the year today.Dr. Sudarshan Ballal, Chairman, Manipal Hospitals, Manipal Health Enterprises Pvt Ltd has been elected as the President of the federation. 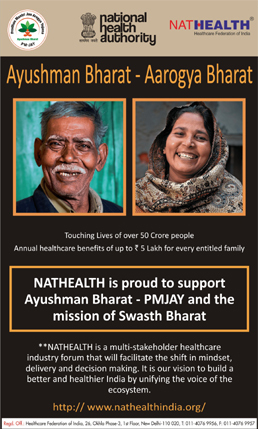 NATHEALTH - Heatlhcare Federation of India to Support the National Health Authority(NHA) to implement the Ayushman Bharat scheme to provide health insurance to 10 crore poor families in the country.